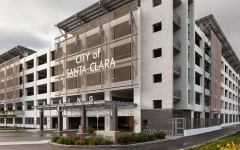 The City of Santa Clara, California commissioned IPD to provide architectural and structural engineering services for the design of the Tasman Drive Parking Structure. 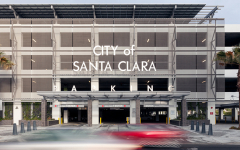 This six-level, 1,821-space garage provides much needed event parking for the adjacent Convention Center and Levi’s® Stadium, the new home of the San Francisco 49ers. 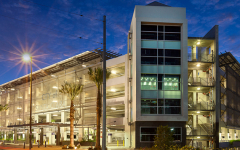 The contemporary-styled parking structure is designed with five elevators and four open stairwells for pedestrians to quickly get to their event and return to their cars. The elevator towers are tile-clad, accentuating the modern design. The lobbies are “event-focused” with upgraded finishes. The exterior design features stainless steel woven-metals screen to provide interest to the structure while allowing for maximum open ventilation. Rooftop photovoltaics have also been installed. 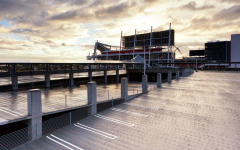 The landscaping of the structure’s entry plaza mirrors that of Levi’s® Stadium and the Convention Center to tie the space together. Security measures include glass-backed elevators and an open floor design. The structure is monitored remotely with the use of 45 cameras.